This book concentrates upon the historic associations of the marketplace in the work of Aristotle, Adam Smith, Karl Marx, and demonstrates how what markets were imagined to entail for society was critical to each author's understanding of the central social problems of their time. 1. Markets and Market Sense 2. Aristotle's Discourse on Commodity Exchange 3. Adam Smith's Market Sense 4. A Critique of the Market Mystique 5. Simple Exchange, Merchant Capital and Augmented Circulation 6. Liberals and Contemporary Globalization 7. The Market Sense of Contemporary Globalization's Critics. Appendix. 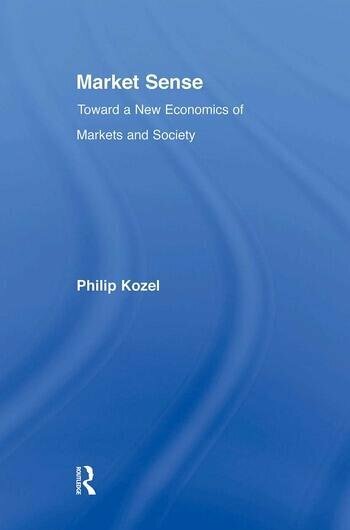 Philip Kozel is a graduate of the Economics Department at the University of Massachusetts, Amherst and has taught at the University of Pittsburgh and at Connecticut College where he is currently a Visiting Assistant Professor. His research interests currently include alternative means of distribution, including local currency movements and piracy.